It usually happens about 10 minutes before supper is ready. My kitchen transforms into a war zone. The two warriors are tired, hungry and itching for a fight. It ends in screams, tears and occasionally blood. Today, however, was different. Supper was baking in the oven and did not need my attention. So I grabbed a book from my newly located "book box" in the corner of the kitchen and calmly asked "How about a book?" just before the missiles started flying. The warriors looked relieved at the respite from battle and eagerly pulled up a chair each and started to listen. I have been meaning to put a box of books in the kitchen for a long while, and finally got around to doing it. I admit it is really not that revolutionary, but it is making quite a difference to us and our routines. As well as the obvious peace-keeping benefits I have already mentioned, having books readily accessible in the kitchen also means we can easily build reading time into our day rather than relegating it just to bedtime. Finding different times to read is one way in which you can help your child to become a good reader. I love cuddling up with my children in their bedrooms every evening and reading to them and I have no intention of stopping that. But sometimes they are tired, I am tired or it is too late to read much. So we make do with one quick book. I am not happy restricting their reading time because of such constraints and so I wanted to make time to read at other times of the day too. Grabbing a few minutes in the kitchen while cooking supper, eating pudding or having a snack works for us. Finding new opportunities for your child to read, or for you to read to your child, is one way of encouraging your child to become a good reader. The more children read, the better they read. It is as simple as that. 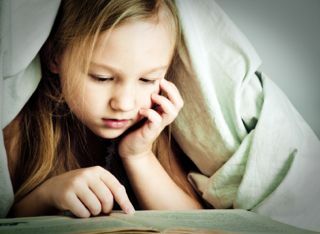 There are other ways you can help your child become a good reader also, such as suggesting books for her to read, letting her take responsibility for her reading, motivating her to read, encouraging deeper reading and continuing to read aloud. More on these below. Even after children can read independently parents still need to be involved in encouraging them to read. In fact, parents may need to be even more involved than before as children get older and spend more time on-line or talking or texting on cell phones rather than reading. Parents can have a significant impact in reversing this trend and helping their child to be a good reader. Why not try some of the suggestions below? For us it was books in the kitchen, for you it may be books in the bathroom or the living room. Or all three. Make sure books are handy wherever you are so that whenever your child has a spare moment you can encourage her to grab a book and start reading. Don't forget to tuck one in her bag too for that inevitable wait in the doctor's waiting room. Build reading times into your routines every day, and not just at bedtime. When your child is reading independently instigate a family reading time when you all sit down quietly together for 20 or 30 minutes and read. Even if your child isn't keen, insist on it. As Jim Trelease says in the highly recommended The Read-Aloud Handbook, you require your children to brush their teeth and clean their room, so don't be afraid of requiring them to read. Create a private spot for your child to read in the corner of a room, under the stairs or on a comfy chair in her bedroom. If you find books your child might like to read you could put them here ready to be browsed through when your child is in the mood. Let your child read late in bed occasionally or use a flashlight under the covers. One of the main reasons children don't read more is because they cannot find books they like to read. Help your child find books she loves and you are on your way to helping her to become a good reader. You know your child well. You know her interests. You know what will capture her imagination. You know the type of characters she will identify with. Use this knowledge to find books you think your child will enjoy reading. 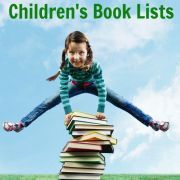 Look at the children's book lists on this site or check out other recommended children's books on-line. Consider buying a guide to the best children’s books which include informative children’s books’ reviews to help you pick a winner. First choose a few books yourself which you think would interest your child and then read the reviews of these shortlisted books together with your child before deciding on her final choice. Don't forget to visit the library often too where a librarian should always be ready with suggestions. Have a look at these books also if your child is a reluctant reader. Make sure you choose books which are appropriate in terms of your child's maturity and reading level. If a book is too difficult your child probably just won't "get it". A useful rule of thumb for choosing a book of the right level (assuming you have the book in front of you) appears in Esmé Raji Codell's How to Get Your Child to Love Reading which is packed full of great book suggestions to help turn your child into a good reader. Ask your child to choose a page in the middle of the book with a lot of text and read the page silently, counting on her fingers the number of words she comes across which she doesn't know and cannot guess. If she finds 3 to 5 words on the page the book will be a challenge. She can read it if she is motivated. 0 to 2 words would be a pleasure read. 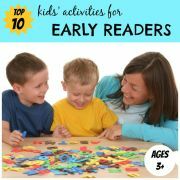 Try to suggest a variety of reading materials: novels, picture books, newspapers, magazines, comics. Anything goes! If a movie has just come out of a children's book, suggest she reads that book before going to see the movie. Although you should enthusiastically make suggestions to your child of books she might enjoy reading, the ultimate choice of what to read should rest with your child. If she is to become a good reader she must control her own reading. According to research, one of the most critical motivators to get children reading is the power of choice. In one study, nine out of ten children said that they were more likely to finish a book they chose themselves. Respect your child's taste even if you don't agree with it (as long as it is age appropriate literature). If she chooses to read magazines or comics, let her. As long as she is reading, she is becoming a better reader. If she wants to stop reading a book because she is not enjoying it, let her. This doesn't mean you can't subtly (or not so subtly) continue to make suggestions about other books she might like to read next. There is a good example from Donalyn Miller in The Book Whisperer of an active, sporty boy in her class who professed to hating reading, but insisted on reading a book more appropriate to dreamy, fantasy-loving girls, since it was suggested by a girl he liked. As the boy struggled with the book for almost a month Donalyn begged him to abandon it, but he refused. So she began to ply him with stacks of books about boys having adventures which he might enjoy more, and talked to him about these books. Eventually he made the choice himself to abandon the 'girlie' book and choose another more aligned with his interests. Importantly it was him who had made this decision, it was not imposed on him by his teacher. He ended up becoming a good reader, devouring book after book by his favourite author. Start by being a good role model. If your child sees you reading she is more likely to pick up a book herself. 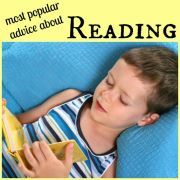 If you read something interesting, share it, so your child continually sees the value of reading. Encourage your child to become a good reader by setting up a reading log in which your child can record all the books she has read, together with a short review and a rating for the book. Consider setting a target number of books to read in a given time. In "The Book Whisperer", Donalyn Miller talks of requiring her 6th grade (11 to 12 year old) students to read 40 books a year. Most of them do. If you have high expectations of your child's ability to read she will most likely rise to meet the challenge and become a good reader. You could also try offering a reward when your child has read a certain number of books, perhaps recognising different genres of books read, to encourage your child to read across genres. 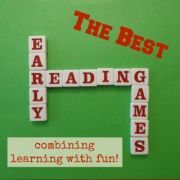 This bingo reading activity is another fun way to encourage your child to read more. For young children you could create a "caterpillar" of books finished. Cut out colorful circles of paper. Decorate one to look like a cheerful caterpillar's face and then add circles for his body, one by one, each time your child finishes a book, writing the name of the book on the circle. Help your child to really understand and engage with books, making connections with the characters, situations and settings. If your child is more engaged with a book she will draw more meaning from it and so will enjoy it more. The more she enjoys books, the more she will read, and so the more likely she will become a good reader. To help your child understand what they are reading better, encourage them to use a combination of reading strategies to enable them to process the words and ideas. Read what your child reads so you can talk with her about the book, making comments and asking questions to encourage her to contemplate the story and talk out loud about it. Do activities with your child based on what she has read, such as arts and crafts, pretend play or dramatisation. Try following up a storybook with a fact-based book about the setting of the story. We have recently tried this with Magic Tree House books which provide interesting settings which you can easily investigate further. Find other connections between books to lead your child from one to another. Don't stop reading aloud once your child can read independently. Under the age of 13 or 14 years old children listen on a higher level than they can read. So when you read aloud to children below this age you can read stories with a level of complexity and interest which they would not be able to read on their own. 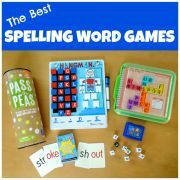 This helps to expand their vocabulary and expose them to different styles of literature. It also provides a great 'advertisement' for books, showing children what interesting books will be available for them to read themselves when they become good readers. Also encourage your child to practice reading aloud to you. This way you can check that she is not skipping over words which she does not recognise easily and you can help her to start to put expression into what she is reading. If your child resists being read to, or resists reading aloud to you, try taking turns reading - you read a page and then your child reads a page. 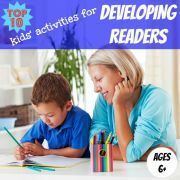 Good luck with trying out these suggestions and helping to encourage your child to become a good reader.